I just picked up a totally stock Cherry 2012 Boss 302 with 6k miles on it. I live in West Virginia, and need good performance tires, but I also need them to work in cold weather. What brand, model, and size tires should I be looking at? I can't speak from experience since I run the Cooper Zeon RS3-S tires on mine. Love the tires and they are reasonably priced to replace. But they are not much good when temps are below 40°. I garage mine from November until April, so not a problem here. Since you are going to drive year around you will want something less high performance and at least 3 season. I have heard great things about the Michelin Pilot Super Sports, and the Continental Extreme Contact all seasons. Good luck. Sounds like a great find. Love to see pictures. Finding a good performance tire the works well in cold weather is difficult. It is a trade off between warm and cold weather performance. You are going to have to find the balancing point between the two suits your use. I run Bridgestone S04 pole positions on mine for the street. Great performance when it is warm out, but they are worthless below 40 degrees. The traction really drops off and they ride like bricks when cold. My car is not a daily driver, so I just don't drive it when it is too cold for the tires. Last edited by Gabe; 2/23/19 at 02:44 PM. MPSS are also useless below 40*. Never. A performance tire that performs in cold doesn’t exist. The only solution is to put your fave performance tires on your best wheels. Then go get Blizzaks or a real winter tire for cold weather and stick those on some takeoff wheels. Speaking of which, I am about ready for Spring. I don’t run the car in winter. But I noticed it is looking a bit sad and lonely in the garage. Tire Rack is recommending the MICHELIN PILOT SPORT A/S 3+ (W- OR Y-SPEED RATED) for all 4 tires. They call these high performance All Season Tires. The look very nice, for daily driving and cold weather, but I don’t see any temp restrictions for them like the stock tires have? I have those on my Car and they actually do pretty good. 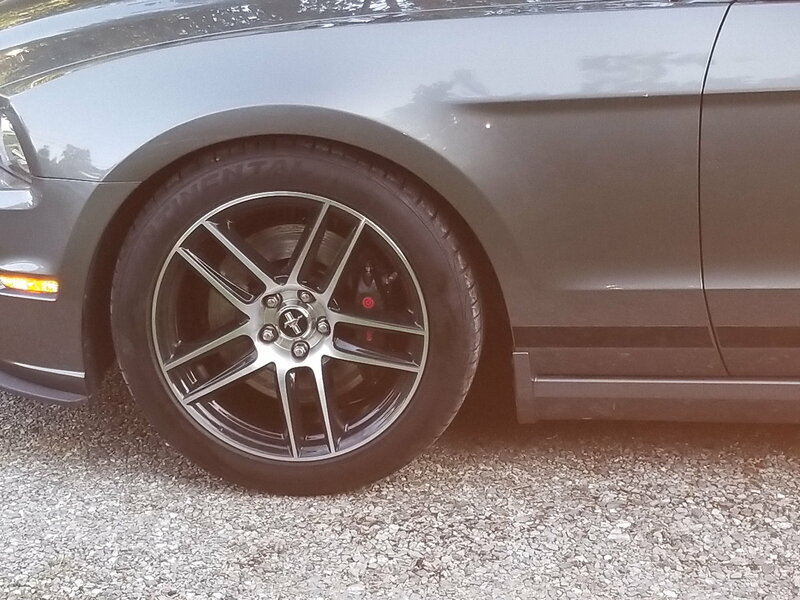 Have not had them in the snow but they don't feel like you are driving on Hockey pucks below 50 degrees like the Pirelli P-Zeros or Continental DW's did. Just do not expect to drag race with these, off the line they are not the best but in cornering they seem to do pretty good. So this Boss has the original stock tires on it. I am picking up the car next weekend, and driving it back to West Virginia in 40-50 degree temps on the Interstate. Is this a bad idea with the stock tires? You should be fine on the interstate at those temps. I drove mine on stock tires down to near freezing without any mishaps. The tires get hard and lose traction as the temperature drops. Just take it easy and leave yourself some extra stopping distance. Just drive her easy shouldn't be a problem. I think I would look for a set of fairly cheap take-off wheels that you can use for the winter tires, and keep the original summer-only tires on the original wheels. That way you can easily swap the wheels/tires for the winter, and still have good summer tires for the summer. The "brembo" style wheels are generally available and pretty cheap. For example, I picked up a set of four brembo-style wheels, with half-worn Blizzak snow tires, for $400. Honestly I was going to order some Boss 302S wheels from Ford, or a set of OZ wheels and put the snow tires on the stock Boss wheels. What are the correct brand and size of Brembo wheels that I should order or find on eBay? Last edited by Glockem45; 2/24/19 at 07:37 AM. 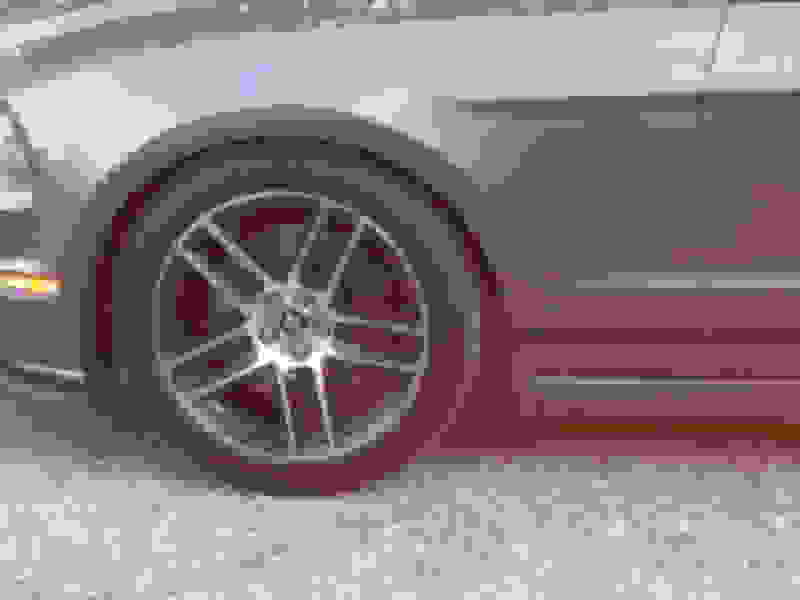 There seem to be two different sets of Boss 302S wheels on the Ford site. What are the differences? @Glockem45 I'm in MD and usually run the Blizzaks in the winter and the G-Force Comp-2 A/S the rest of the year. My bad, put up the wrong one. Was thinking of a cousin to MPSS in the All Season realm... Meant to suggest the Michelin Pilot Sport A/S 3+. Looks like you found them though. Last edited by shaneyusa; 2/24/19 at 10:13 AM. I am thinking 1 is 9 inch for all 4 corners and the other is 9/10 for staggered. Right now the wheel section is doing the finish spin cycle and not loading. And i know it’s not the look most people want. But for a winter tire, if you have a choice, narrower is frequently better. Last edited by 759Rider; 2/24/19 at 01:49 PM. Goodyear Eagle RS/A ZR all season tires?